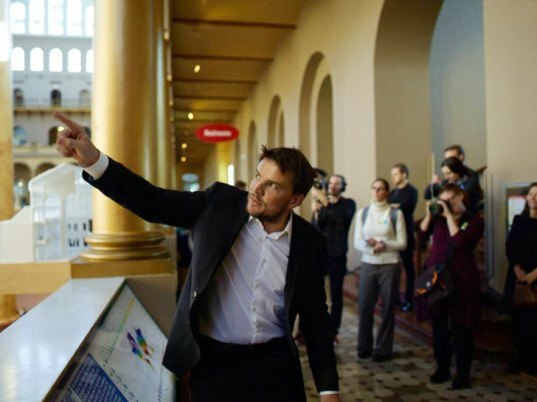 Young starchitect Bjarke Ingels has been named as this year’s guest speaker for the Annual Architecture Lecture at London’s Royal Academy of Arts. At just 40 years old, the Danish architect is the youngest architect ever to be invited to deliver the speech. Ingels, founder of BIG Architecture, will speak to an audience of architectural professionals on July 13. For the past twenty-five years, the Royal Academy in London has presented the prestigious Annual Architecture Lecture, inviting the a top architect in the world to speak each year. Past participants have included Norman Foster, Rem Koolhaas, Renzo Piano, and Pritzker Prize winner, Rafael Moneo for last year’s 2014 lecture. In addition to his latest book, “Hot to Cold,” Ingels was chosen for this year’s speaker because of his innovative and unique projects across the globe. His philosophy of using design as a tool to discover the potential of project based on cultural, climate and contemporary life has influenced important his architectural projects. The Royal Academy chose Ingels as speaker based on influential projects such as his redevelopment of London’s Battersea Power Station, his West 57th courtyard/skyscraper residential project in New York, and the Amager Bakke Waste-to-Energy Plant in Copenhagen. Sponsored by our friends at Dezeen, tickets are available to the public for this lecture, which takes place from 6:45 to 8pm on July 13 in London.